Racing Beat Headers for the 1994-1997 Miata (manual transmission only) are the result of exhaustive research and engineering efforts, utilizing both chassis dynamometer and road testing. 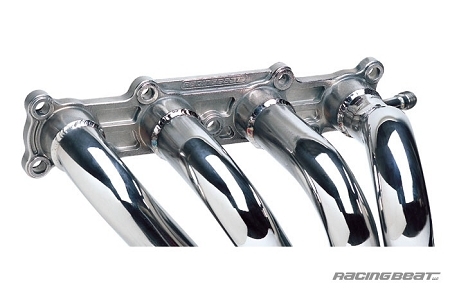 Our Racing Beat headers incorporate a tuned 4-to-1 design configuration to optimize exhaust gas scavenging characteristics and power output, while improving both the exhaust note and retaining the factory catalytic converter. Hundreds of development hours and over 200 on-chassis dyno runs were used in the refinement of this header. The Racing Beat Miata header has been design-tuned to provide measurable horsepower and torque improvements throughout he entire RPM range. Manufactured entirely from 304-stainless steel for superior durability, this 4:1 Miata header will offer years of enthusiastic performance driving. Our exclusive cast stainless steel engine-to-header flange features specially designed exhaust ports which transitions smoothly to the primary tubing. For the 1.8 liter Miata engine our header utilizes large diameter 1.7" OD tubing for the primary tubing, and then collects into 2.375" OD secondary tubing. All emissions control devices are retained. Each header kit comes complete with installation instructions and replacement rear gasket. The original engine-to-header can be reused if there are no visible signs of distress or wear.